Cracked pepper steak burger for those who enjoy the traditional flavors of beef. First we prepared the grill with Mesquite lump charcoal. The flavor of any hardwood lump charcoal is a compliment to the flavors of the burgers. We suggest the same for griling steak. 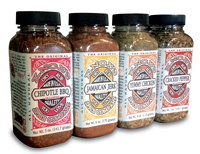 Mix ground beef and 1 to 2 tablespoons of Knox's Cracked Pepper dry rub seasoning. Make patties and put aside. This recipe is excellent using ground Buffalo as well. When the grill is hot, flatten out the coals into an even layer and oil grill grate. Place burgers on the grill grate and cook for about 4 or 5 minutes per side. Do not press the burgers. Pressing them squeezes out succulent juices and flavor. When done grilling garnish with fresh sliced lettuce, tomato and onion. Enjoy! Knox's Cracked Pepper dry rub seasoning makes a hamburger more like a steak burger. The spicy earthiness of the cracked pepper compliments the flavor beef. Do not underestimate the heat of cracked pepper. This burger has a bit of bite.